Subscribe to our Monthly e-Newsletter Now! We are pleased to introduce T'DA® 2-day value-added assembly on Glenair's MIL-DTL-83513 (M83513) Micro-D connectors. QPL'd and made in the USA, these subminiature connectors feature outstanding mating performance and high-density TwistPin contacts with minimal resistance. Because they are designed to perform in high-shock, high-vibration environments, Glenair's M83513 connectors can be used in a wide range of military-aerospace and space-grade applications. Available in both MIL-SPEC and MWDM COTS versions with a variety of termination, shell, and plating options. 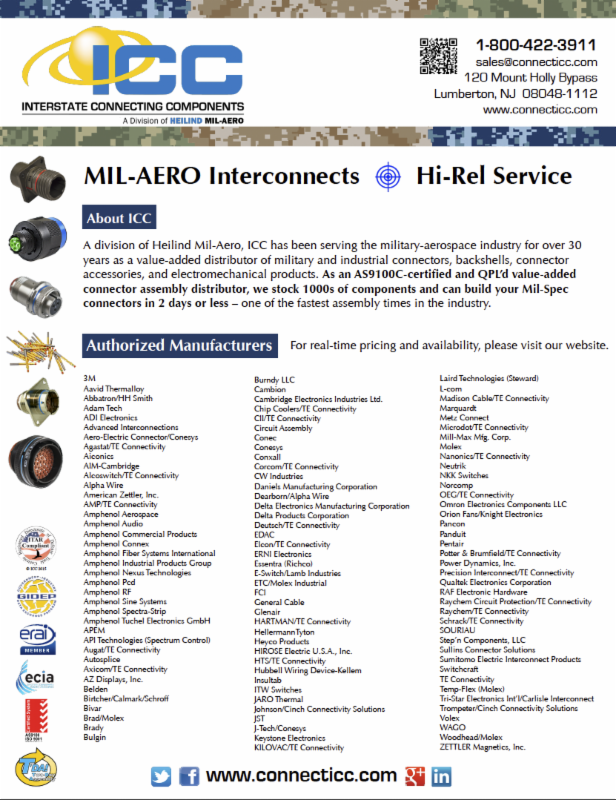 Check out our new line card for a complete list of our innovative manufacturers!